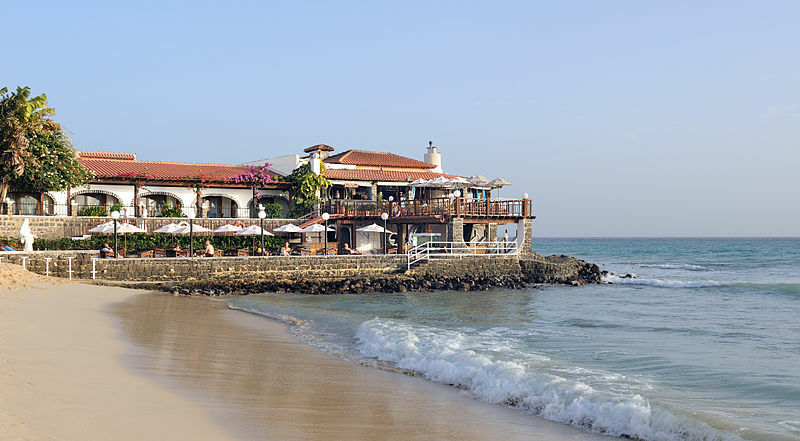 The cuisine of Cabo Verde is a robust cuisine derived from Portuguese and African influences. 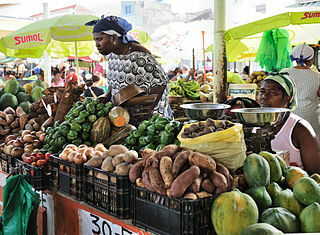 The Portuguese brought livestock to the islands and the Africans brought numerous tropical crops from the continent. In addition, fruits and vegetables from the new world and the east were brought to the islands at one time or another. One of the most ubiquitous ingredients in Cabo Verdean cuisine is corn. 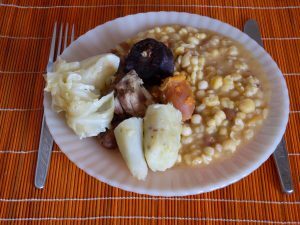 Cachupa, the national dish, is a stew made from hominy and beans with fish or meat. It can contain sausage, bacon, yucca, sweet potatoes or any other number of ingredients, depending on what is at hand. The problem I had should have been obvious to me before I started. It required 5 1/4 cups of corn meal to be cooked for an hour and a half with dried black eyed peas. I should have realized that this was an error in translation and that it should read 5 1/4 cups of dried hominy. Anyway, after the smoke alarm went off and everybody calmed down, things went well. The other ingredients were browned and cooked separately anyway and I just ended up cooking another batch of the black eyed peas separately and adding some of the cornmeal to thicken the stew (about a half a cup). It turned out delicious. Added a pigs trotter (foot) as indicated, thick cut bacon, the sausage and some cubed beef. Then later sweet potatoes. The recipe said add the yucca at the end, however it was not even listed on the ingredient list. Anyway, I recommend this dish highly, but will not torment anyone with the recipe I followed. There are many versions online, all of varying levels of complexity. Instead, I will share my cocktail creation of the month, The Green Cape. But first, a few more words about how much Cabo Verdeans use corn. As mentioned, hominy, or dried corn is commonly used in Cachupa (except by me). Xerem is a more coursely ground corn, pounded to the consistency of rice. It is used in many soups and side dishes. One step further, and similar perhaps, to cornmeal, is kuskus, which can be steamed and enjoyed with molasses or sugar and milk as a breakfast dish. Additional dishes include ‘pastels with the devil inside’, which are deep fried pastries containing a spicy fish filling, octopus stew, beans and rice, and fish- particularly tuna and lobster. 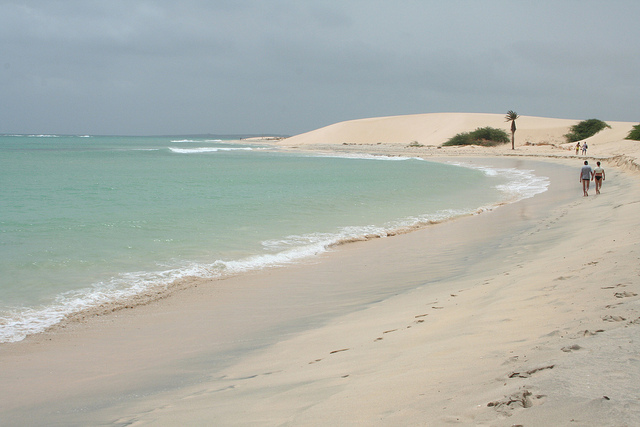 The famous, or at least most famous beverage from Cabo Verde is grogue. It is a rough, rum type beverage made from sugar cane. It is often mixed with molasses, citrus fruit and cloves to create a drink known as ponche. My cocktail creation this month is inspired by grogue and the caipirinha, which is a common drink at the beach resorts of Cabo Verde. 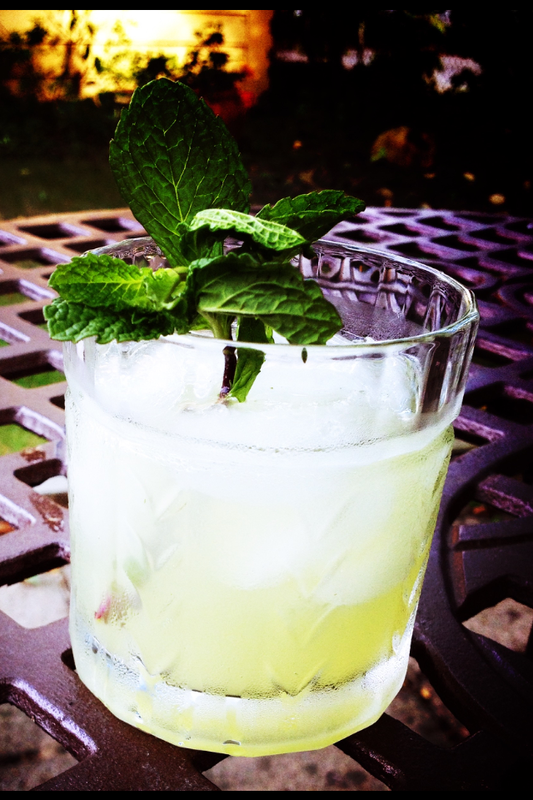 Muddle mint leaves with lime juice and Falernum. Add rum and Chartreuse and shakewith ice. Double strain into a rocks glass over ice and garnish with mint or lime.